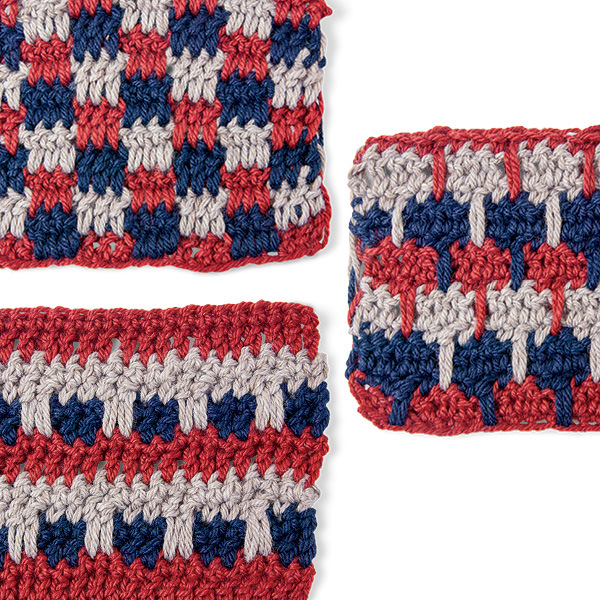 Add texture and color to your crochet with the fun and easy spike stitch. In its most basic form, you make a spike stitch by inserting the hook in a previous row or round before completing a stitch. 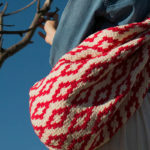 The new stitch thus drops down over 1 or more rows, creating a spike of texture and/or color. Since you can work the spike stitch on any sort of crochet fabric, with your choice of crochet stitch, repeating the same color or adding a new one, it gives you many design options. Here we’ll see how to work a small V, then look at variations that create radial line, houndstooth, animal fur, geometric patterns, and more. Begin with a base fabric: stitch fabric as normal, working through both loops of the stitches. For this example, we’ll make a single crochet swatch, stopping at the point we want the first spike stitch. Chain 16. Starting in 2nd ch from hook, sc in each st across. Work 3 more rows by chaining 1, turning and working sc in each stitch across. Ch 1 and turn once again. Work sc in the first 3 stitches of this row. Now make the spike stitch: work a single crochet as normal except insert the crochet hook in the stitch 1 row below the stitch you would normally work. This will create a small V.
1. Start the fabric by crocheting several rows of single crochet through both loops (here, 4 rows of single crochet in brown). 2. Single crochet to the position of your spike stitch (here, 3 single crochet stitches in pale green). 3. Insert the hook in the stitch 1 row below (Figure A). 4. Yarn over and draw up the loop to the height of your working stitches (Figure B). 5. Yarn over (Figure C) and draw through both loops on hook (Figure D). In these tutorial photos, you can see that the spike stitches all line up vertically, creating regular blips of color that break up plain old stripes. Now imagine all the possible variations: worked in 1 color to add texture; worked with offset or randomly placed V stitches; worked with taller or shorter spikes; worked with multiple colors. The Chromatic Hoodie from Interweave Crochet Winter 2014 provides a stunning example of spike stitch colorwork. Its base fabric is made with single crochet stitches worked in both loops, using a variegated yarn. Spike stitches worked with half double crochets add large Vs of color. You can also work the spike stitch in the round, and if you build up the base fabric with several rounds, it will feel and look similar to the spike stitched worked in rows. However, if the spike stitch is worked on the second round of a project, all the spike stitches will be worked in the center hole of the first round. These radiating lines form a plus sign in the Polaris Pillow from Love of Crochet Winter 2016. Motifs for this Polaris Pillow start with a round of double crochet to create a center circle, then a second round is crocheted in a contrasting color in stitches of various heights to turn the circle into a square. As the second round is worked, a single half double crochet spike stitch on each of the 4 sides makes the plus sign. The spike stitch can also break up the regular lines of a check pattern to create the classic houndstooth. 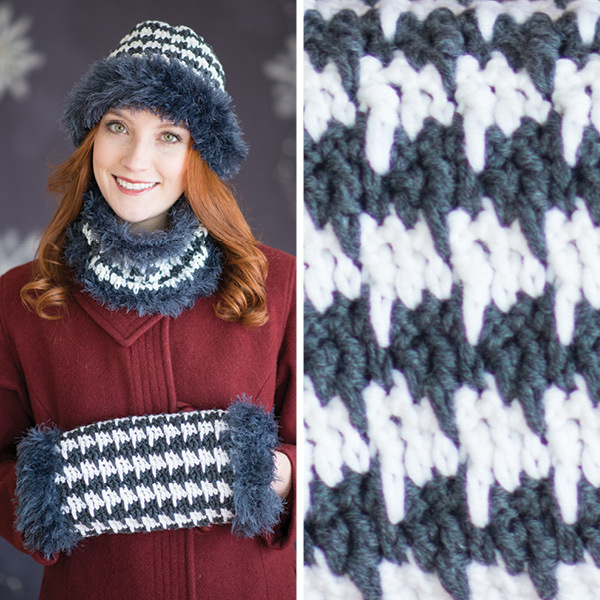 For classic houndstooth, seen in the Houndstooth Trio from Love of Crochet Holiday 2014, work stitches in various heights as normal, then strategically work a single crochet spike and treble crochet spike one row below. The spike stitch creates a hard line over the stitches in the row below whereas the various heights in stitches create nice big blocks of color. Or form related patterns, such as the one on the Twilight Duster from Interweave Crochet Winter 2009. Here, crochet as normal and occasionally work a treble crochet spike stitch three rows below the normal stitch. You can also employ the spike stitch to mimic critters. Color combined with the spike stitch helps simulate fur, shells, and wings in the examples below. In the Panda Party from Love of Crochet Holiday 2014, spike stitches help break up the hard line between colors, softening them to look like fur blending. 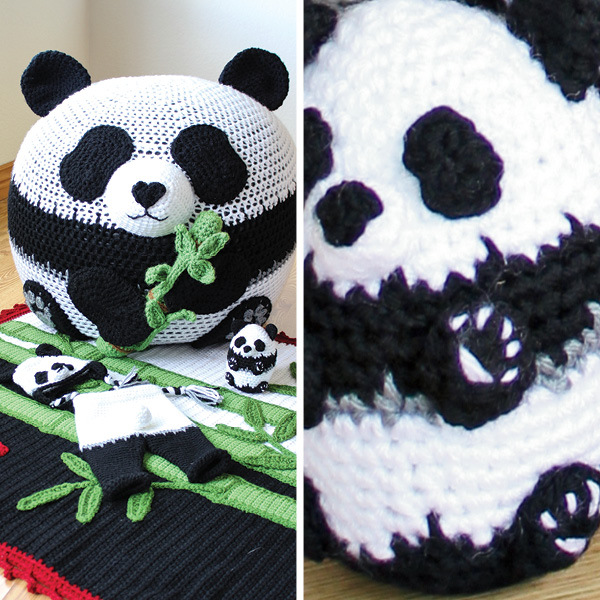 The big Panda Bean Bag features half double crochet fabric and half double crochet spike stitches in white, black, and gray for a faux fur look. Its tiny companion, the Stuffed Animal (right) uses single crochet fabric with single crochet spike stitches. 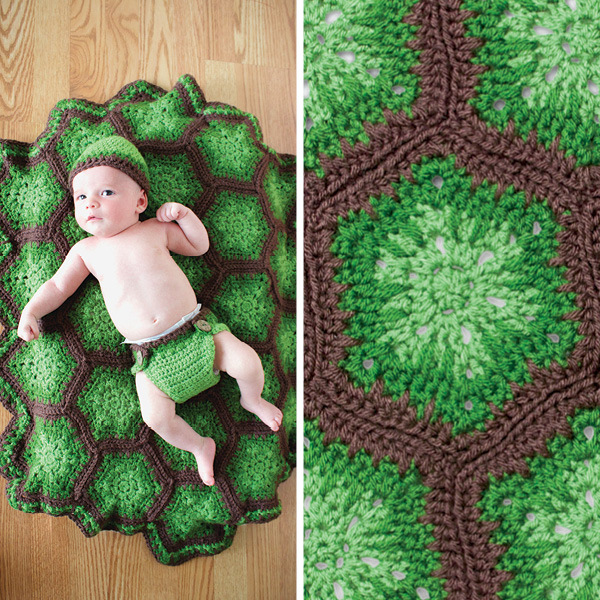 Spike stitch and tonal yarns can make realistic turtle shells too. Here, the blanket from the Teensy Turtle Baby Set (Love of Crochet Fall 2014) employs two shades of green for its hexagons, which are then joined in brown. Spike stitches of dark green over light green, then of brown over dark green, give the shell more subtle shading and a three-dimensional look. 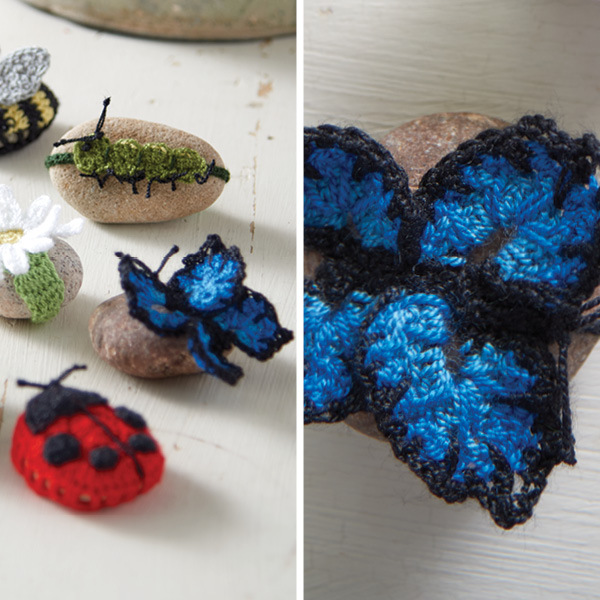 Use the spike stitch to create beautiful textures that look like butterfly wings as seen in the Garden Buddies pattern (Love of Crochet Spring 2015). A darker blue spike stitch is worked over a lighter blue to create a gradient while a highly contrasting color —black in this case—is worked in a longer spike stitch for veins in the butterfly wing. The spike stitch really shines in geometric patterns too, when you work it in multiple colors 1, 2, or 3 rows below at regular intervals. See “Multicolored Spike Stitches” in Love of Crochet Holiday 2014 for Checkerboard, Narrow Spikes, and Blocks and Stripes patterns. 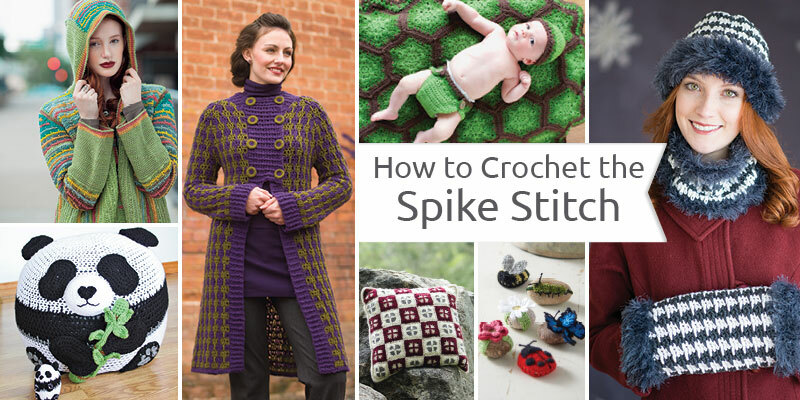 If you work spike stitches in the traditional method given above, you’ll end up with a bulky fabric. To reduce this bulk, plan ahead: strategically place chain stitches 1 or 2 rows ahead of the spike stitches. When you work the spikes (usually with a taller stitch such as double or treble crochet), they’ll cover up the chains. This method takes a bit more planning, but results in fabric with more drape. This technique was used in the Twilight Duster and Multicolored Spike Stitches tutorial mentioned above. It wasn’t until I started writing this blog post that I realized how many different ways there are to make and use the spike stitch. Previously, I just thought of the single crochet spike stitch worked on a single crochet fabric. But after flipping through Interweave Crochet and Love of Crochet magazines, I was pleasantly surprised by how many ways designers used this stitch on different types of projects to create different effects. Whether you’re new to the spike stitch or have been using this technique forever, I hope this post inspires you to consider all the ways it can brighten up your projects. 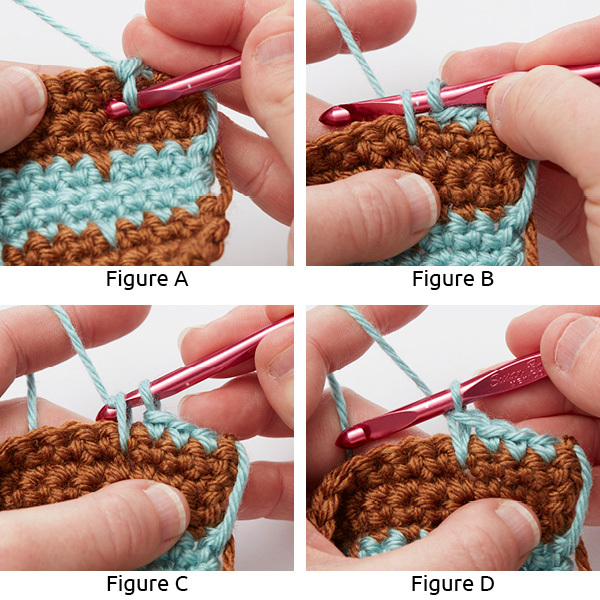 Do You Crochet Spike Stitch? Don’t Miss Tapestry Crochet at Interweave Yarn Fest!